Back in early 2009 I'd been working for JetBlue in Reservations and their TrueBlue departments for a couple of years. It was a pretty sweet gig where I was able to work from home and had flight benefits for myself and my family. I loved the brand and proactively stayed involved in all happenings within the company. Because I was proactively involved setting up communities in our Salt Lake Service Center via social media, I was recommended to the folks in New York when they decided they needed some assistance with their @JetBlue Twitter account. As I've mentioned here before - that's when the love affair began. I fell for Twitter, and I fell hard. 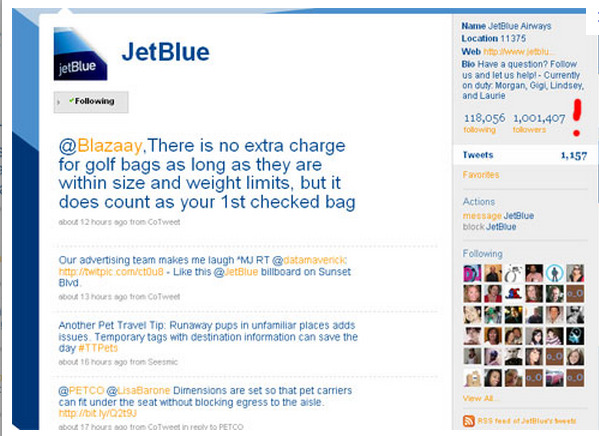 Even though JetBlue had about half a million followers when I really got started with them, they're account was still relatively "new." As you can see, for a time, Morgan (@MHJohnston) and I were the only one's really managing it. 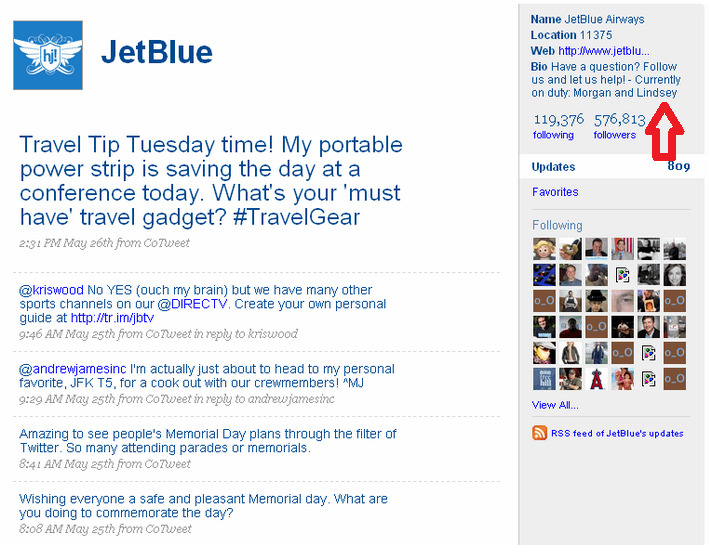 I absolutely adored my time working with JetBlue and their Twitter feed. I loved the opportunity to intimately learn the ins and outs of Twitter as a social media channel and will forever be grateful for the time I spent there. It was exciting to watch our community grow from 500,000 to just under 1.7 million followers, and was incredible to connect with our fans on many levels. Skip ahead a few years and I'm on my own seeking some new opportunities. I'm still enthralled in the social media scene and love it just as much. Recently, when attending the most recent Social Commerce Exchange here in Salt Lake City, to topic was Twitter and the focuses were Twitter tips and best practices. Because I thought the insights shared were so accurate and helpful, I'm bringing them to you here. The first presentation was brought to us by Kyle Snarr, AKA @kyality. His stance was that Social media is the great marketing equalizer where we see people working to be more branded, and brands working to be more personal. Such an accurate observation. Here are his guiding principles for Twitter, and I think these apply to brands as well as individuals. Kyle was followed by Matthew Bradley (AKA @MatthewBradley7) who took a presenter's place at the last moment due to an unforeseen circumstance, but did a great job sharing some great insights. Use existing channels to announce your Twitter account. Use links/buttons to your account in your email signatures and conversations. Retweet "classic style" - DO NOT use the easy "Retweet" button Twitter provides. Be aware of the trending topics and how you could use them relevantly. Sit in the stream and engage. Keep it short. Stats show tweets 100 characters are more effective. Use unique words - open that thesaurus. Use hashtags - but only 1 or 2 per tweet. Be consistent - 3-4 tweets per day. Scoop your fans - everyone wants to be in the know. Recognize, retweet, and reward your fans. For big problems consider an approach like this: 1 public tweet explaining the situation. Reply to @ mentions with DMs to reduce clutter on your feed. Share updated publicly. Switch to @ replies when individual issues resolved. Use tools to schedule tweets, monitor, maximize your experience, etc. Keep your personal and professional accounts separate! Do not schedule tweet and split. Be available to monitor resoponses! Do not retweet links you have not read/researched. Don't respond or tweet hastily. I sort of feel like I know Twitter inside and out. It's my preferred social media channel and I love the opportunity it gives us to connect with so many types of people that would typically be outside our own circles. As a self-proclaimed Twitter junkie, I thought these insights shared were helpful and insightful and a great reminder of how best to take advantage of this amazing medium. If you're not on Twitter - you should be. If you are on Twitter, you can find me via @linzlinzlinz. If I'm not already following you, leave a comment below and I'll get on that ASAP. I am regular visitor, how are you everybody? This article posted at this website is actually fastidious.